Secret Globalist Treaty Threatens Internet Freedom!!! Wikileaks has released a 95 page, 30,000 word document spelling out details on the Trans Pacific Partnership (TPP). The secret globalist agreement will have a significant effect on a wide range of issues including internet freedom, medicine, patents, and civil liberties. The cabal will meet in Salt Lake, Utah, between November 19 and 24. 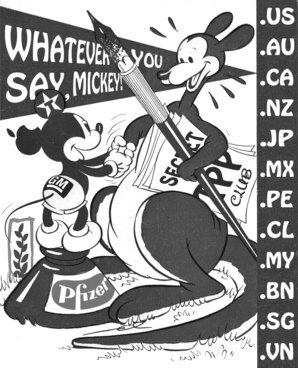 The draft text for the TPP Intellectual Property Rights Chapter spells out provisions for implementing a transnational “enforcement regime” designed to supplant national laws and sovereignty with a globalist construct. The TPP is by far the largest and most oppressive economic treaty devised thus far. It will have an impact on a staggering 40 percent of worldwide GDP. The TPP is the forerunner to the equally secret US-EU Transatlantic Trade and Investment Partnership (TTIP). Both treaties combined will cover 60 percent of world GDP and exclude China. Enforcement will be accomplished by “supranational litigation tribunals to which sovereign national courts are expected to defer.” According to the document, the globalist courts can conduct hearings with secret evidence. In addition, aspects of the treaty resemble SOPA and ACTA treaties with draconian surveillance mechanisms. In early 2013, thousands of websites “went black” to show solidarity in opposition to SOPA, or the Stop Online Piracy Act, legislation that seriously threatened the functionality of the internet. “SOPA was an attempt to put the power of information back in the hands of an elite few who are rapidly losing the ability to control what the masses are reading, hearing and seeing,” Mac Slavo wrote in January, 2012. Obama is poised to fast-track the secret agreement. “The US administration is aggressively pushing the TPP through the US legislative process on the sly,” said Wikileaks editor Julian Assange. “If instituted, the TPP’s IP regime would trample over individual rights and free expression, as well as ride roughshod over the intellectual and creative commons. If you read, write, publish, think, listen, dance, sing or invent; if you farm or consume food; if you’re ill now or might one day be ill, the TPP has you in its crosshairs,” Assange added. This must be stoppped so share and post this everywhere!! !